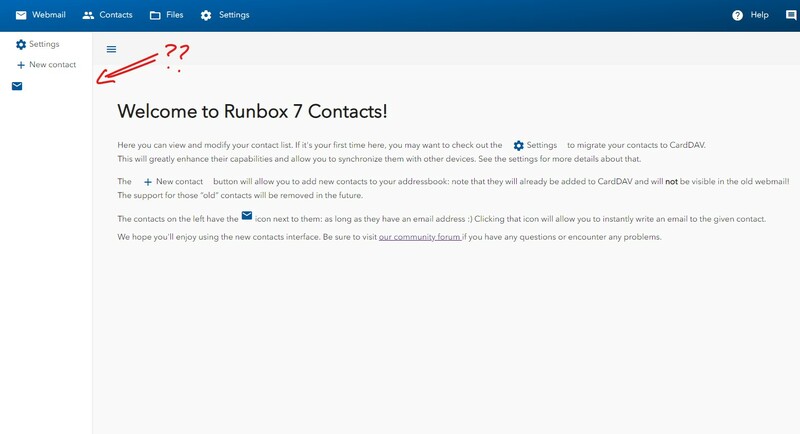 It is my pleasure to announce Runbox 7 Contacts… again! You may have noticed them already, but they’ve been pretty basic so far, providing less features than the Contacts interface in the old webmail. Today is the day we change that, bringing the Contacts to the same standard as the Webmail itself. One of the key parts of the new Contacts (and mostly the reason why they took so long!) is changing the way we store your contacts in Runbox. So far, they’ve been sitting in our database, with no other way to access them than through the web interface. This has been a significant annoyance to those of you who would like to use your contacts across many different apps and devices, not necessarily related to Runbox itself. As of today, this changes. From now on, all contacts will be stored on a CardDAV server – an open standard for sharing contacts and address books between different devices. You can now access your Runbox contacts everywhere. No need to even use Runbox 7 at all: you can use any other email client, any contacts app on your computer or your phone and you’ll have access to the same contacts everywhere. Add them on your phone, edit them on your laptop, and then they’ll still get suggested by Runbox 7 when you create a new email. Runbox 7 Contacts contains all the information that you need to set up your other apps that you use. Transforming all the contacts that Runbox currently has into this whole new format may sound like a big undertaking: and it is! And like with any data, there’s a chance that something will go wrong with the conversion. We did a lot of testing internally, but there’s still a chance that something has slipped through the cracks, and one of your contacts will turn out in a different way that you thought it would. This is why the migration to CardDAV is opt-in for now – meaning that nothing will actually get converted and moved to CardDAV until you ask for it. We also won’t be removing any of the existing contacts from our database – at least until we’re sure that all of them have been migrated successfully and everyone’s happy about it. If you find anything wrong with the new Contacts, please let us know! If something didn’t end up as it should after the migration, if some data shows up incorrectly in other apps, or if something is just plain broken or missing in the web interface, don’t hesitate to complain. We’ve put a lot of effort into testing the new contacts, but with almost 20 years of serving email to our customers we know how creative you people get :­) So if anything can be improved, let us know, and let’s create the best Contacts we can – together. I just tried migrating my contacts as described but keep getting “Internal server error OK :(”. Not very helpful! Can this be fixed please? I checked the Runbox 7 Contacts and those are showing up. Before I switch to the new sync rule I would like to know how to sort them. I’m used to sort the contacts by Last name, but no sort tool in Rbox7. @richardm thanks for letting me know! I looked into our logs and I think I’ve identified and fixed the issue; can you let me know if it works any better now? @1252 indeed, it looks like there was is no way to sort them just yet in RMM7 – silly me :­) I’ve implemented basic sorting and will hopefully roll it out in the next few days. Thanks for pointing it out! Tadeusz, I just tried to add the Runbox community summary email "community@runbox.com" to my contacts. I didn’t have any contacts as of yet, so it was the very first one. I used the email field, the “Nickname” field, and the “Business” field. Now that it’s saved, it won’t let me click on the contact to edit it, and there’s nothing listed in the sidebar to say what contact it is. Is this a bug, or did I do something wrong? Also, will we be able to add contacts directly from emails received in Runbox7 in the future? @jstick oops, that’s definitely a bug :­/ It’s an oversight of mine, since the names on the left side panel show the first and last name only: and since your contact has neither, nothing shows up. You did nothing wrong: I have :­) Fortunately it’s a small thing; I’ll fix it first thing tomorrow and deploy as soon as I can so that this doesn’t happen anymore. Thank you for pointing it out with a detailed explanation! As for adding contacts directly from emails, I’ll check with other team members to see what would be the best way to add this to Webmail. Thanks for your feedback! No luck I’m afraid - it still fails with “Internal server error”. @richardm I’ve identified the issue that was stopping you from getting your contacts migrated; it should all be good now. Thank you for your patience and feedback! @jstick the contacts with just nicknames are showing up now. There is a currently a bug however that breaks sorting when any such contact exists: I already wrote a fix for this and I hope to roll it out to runbox.com later today. something is wrong. The sorting tool is sometimes there, sometimes not. The bad thing is when the tool is displayed and selecting a sorting type from the dropdown menu nothing happens. Refreshing the screen the tool disappears completely. After few other refreshes or by leaving and returning to Contacts it reappears but is unresponsive. This all on Mac (macOS 10.14.4) running Safari 12.1 The same situation on iPad (iOS 12.2) and same Safari. Additionally there are some design things, but on this later. P.S. I prefer to stay on the “old” Runbox CardDAV and CalDAV which works perfectly in Apple environment. In Contacts even the contacts pictures and company logos are transferred between devices flawlessly. PLEASE don’t touch the “old” implementations! Fore sure I would NEWER use the Runbox7 with all the new things pushed in it. @1252 I’ve just rolled out some fixes to contact sorting, hopefully it works better now. Meanwhile I’ll make sure it all works as intended on Macs and iPads – thanks for pointing it out. As for the PS: the existing CardDAV and CalDAV is here to stay and not going away – the whole thing with RMM7 Contacts is to provide a web interface that will allow you to edit them in the browser as well all the devices you’re already using. The old webmail could not do that, as it maintained its own list of contacts which you could not sync with any other devices, which is quite limited in its usefulness. After clicking to Migrate them, nothing happened, though a message that I had 381 contacts in the old style that haven’t been migrated yet. When selecting Last name, it sorts by Last name but the First Name is first on the left side. Most recently created contacts remain on list top, whatever the Last name or First name is. Personally I joined this Forum just to try to push the Files webDAV access and eventually the Safari favourite bookmarks synchronisation between Apple devices, but I’m giving up. Bye! That is by design, yes: sorting was meant to just change the order without altering the way the contacts are displayed. I was not able to reproduce this; having created „John «Newguy» New” he gets rightfully stuffed in the middle of my list and reacts to sorting order properly. I can investigate and fix it if you can give me a more detailed example that’s broken. Sorry to see you leave, but bye, and thanks for all your feedback! @nickilove Migrating 381 contacts can take a little while, and the UI doesn’t currently do a very good job communicating that it’s doing something potentially time-consuming under the hood.­ It’s possible that if you check it now, after some time has passed, the contacts will have been all migrated and ready to use – if not, please send me your Runbox username in a private message and I can take a look if there was any holdup in the migration. The migrate button worked this time, but I now have duplicates of the majority of my contacts! Not all, but most. Could this be because, having clicked the “migrate” link (with 122 contacts), the app updated itself and when it had finished it said there are 84 contacts to migrate, so I clicked the ‘migrate’ link again? I don’t know if these are true duplicates or if the migration has separated out some data into each one… Do I have to check through all the duplicates and manually delete as necessary? Ah, yes, I can see why it could have happened :­/ I have manually(-ish) fixed it for you to the best of my abilities: you now have 122 contacts in both the old database and CardDAV – let me know if anything has gone missing or mismatched, but I’m pretty sure it should be a-okay :­) Sorry for the confusion and thanks for your feedback and patience! I too, have 2 to 3 listings for each contact. I don’t see how to group them as I have them in R6. Please advise–thank you. @nickilove if you can send me (maybe in a private message) your Runbox username I can look into it. Browsing and editing contact groups is almost done; I hope to be able to roll it out tomorrow. reworking the migration mechanism as we speak so that this kind of problem doesn’t happen anymore. Meanhwile, enjoy your contacts and I hope they’re all good now :­) Thank you for your help!